Grand Master Juan de Homedes. If in 1523 Charles V already looked towards the Turkish menace in offering Malta to the knights, within a few years the need for their presence there had been redoubled in urgency. The area of mounting danger was North Africa, whose political division at that time was very different from that of later centuries. Its centre was dominated by Tunicia, a large kingdom stretching from the Gulf of Syrtis to beyond Bougie; the capital, Tunis, had been for over a century the most important African city west of Cairo, with a population of some 30,000. Algiers and Tripoli were secondary ports, both of which were brought under Spanish control early in the century. In the west, Morocco and Tlemcen had for some years been faltering under the impact of Portuguese and Spanish expansion, but this advance provoked in its turn the rise of the Barbary corsairs. The most famous of them, Chaireddin, known as Barbarossa, seized Algiers with his brother in 1516; he lost little time in placing his lordship under the rising star of Turkey, and in 1529 he ousted the Spanish from the fortified rock which controlled the harbour. From this conquest began the history of Algiers as the chief corsair port of Barbary, a position it maintained for three centuries. The new threat to Spanish and Italian waters was clear enough, but it was soon turned into a far graver one: Barbarossa travelled to Constantinople to be appointed High Admiral of Soliman's navy, and in 1534 he seized Tunis and annexed it to the Ottoman Empire. His exploit was one of the most signal Turkish successes of the century; the conversion of the leading kingdom of Barbary into an Ottoman vassal, with the extension of Turkish sea-power over the entire southern Mediterranean, posed such a threat to Christendom that Charles V called together a virtual crusade to reverse the loss. With the exception of France, all the principal Mediterranean states contributed their fleets and soldiers. The Grand Master Pietro del Monte threw the Order's resources into the venture. In July 1535 the Christian fleet appeared before Tunis with the Emperor at its head; but it was within the city itself that the issue was decided. The Knight of St John, Paolo Simeoni, who was held there as a slave, roused his fellow captives in rebellion, and Barbarossa was obliged to flee. Charles V restored the King of Tunis and left a Spanish garrison at La Goletta, which together with those at Bougie and Tripoli kept Tunis in vassalage to Spain for the next forty years. 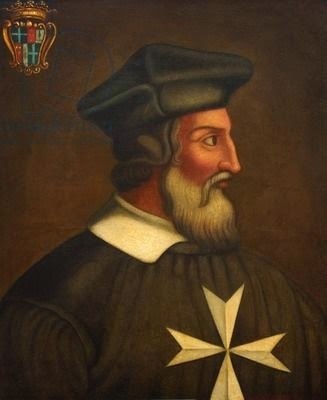 When Charles V granted Malta and Tripoli to the Knights of St John his aim, certainly, was to make them the first line of defence of his Italian lands, and not least to support Spain's control of the Tunisian kingdom. Yet it is wrong to say that in doing so he diverted the Order from its proper task. In attack, the imperial campaigns were the best vehicle for the knights' war against the Infidel; as to defence, the Moslem threat fell, by geography, overwhelmingly on the Italian and Spanish shores of Charles V's empire. By contrast France carried its rivalry with the Emperor to the length of concluding in 1536 an offensive treaty with the Turks, who were thereby enabled to strike deep at the heart of Christendom, their corsairs plundering Christian shipping and ravaging the exposed coasts. The consequence of this shameful alliance was to make the traditional predominance of the French in the Order of St John an obstacle to its proper duty, while conversely it led to a period of unprecedented Spanish influence in the Order's affairs. It would therefore be appropriate to speak of the years which opened with the reconquest of Tunis as the Spanish period of the Order's history, and the more so because it was a time when the military prowess of Spain and her ideals of chivalry and religious militancy gave their tone to Catholic Europe. The symbol of this hegemony within the Order of St John was the long reign of the Aragonese Juan de Homedes, who was elected Grand Master in 1536. He came to government at precisely the time when France made its treaty with Turkey, and the seventeen years of his rule were filled with the baneful consequences of that alliance. The international conflict was moreover reflected by unprecedented rivalry within the Order he ruled. Charles V's dominion over Castile, Aragon, Germany and much of Italy assured him the total or partial loyalty of four of the Langues of the Order, a state of affairs which threatened to overturn the advantage formerly enjoyed by the French. After Henry VIII swallowed up the priories of England and Ireland, the dwindling band of English Catholic exiles also increasingly became clients of the Emperor. The anti-Spanish party in the Langue of Italy seems to have maintained its strength, but if that element failed the danger was that the subjects of Charles V would sweep the board, winning the predominance which the French had traditionally regarded as theirs by natural right. In these circumstances we can understand the resentment of the French knights, and we can understand too their wounded pride at the consciousness that their country was betraying the cause to which they had dedicated their lives. Less sympathy is due to those chroniclers who have imposed the distortions of the French party as the prevalent history of the Order. Bosio's sly denigration of Homedes was elaborated by later historians into a veritable black legend, representing the Spanish Grand Master as a hated tyrant, elected through an intrigue, who enriched himself and his family at the Order's expense, whose personal jealousies made him exclude his best subjects from their due opportunities, and whose avarice was responsible for the loss of Tripoli. These charges, each and severally, are the work of propaganda, as is the misguided orthodoxy which has represented Spanish influence on the Order as an alien burden on its natural destiny. Given the national alignments of the time, it is a view that does not so much distort the truth as stand it on its head. The first task that confronted Homedes was that of turning Malta into a secure base for the Order's martial undertakings. Military experts had already pointed out that the Borgo was a difficult site to defend, being surrounded on all sides by higher ground, including the peninsula of Sciberras across the harbour. Their advice was to build a new city on Sciberras itself, but such an enterprise was beyond the Order's means, and would have implied that Malta was a permanent home. Homedes therefore followed L'Isle Adam in preferring the provisional fortification of the Borgo. The Knights of St John could not see, as we can, the centuries of Ottoman power that lay ahead, and the ambition of returning to Rhodes continued to animate them. But much had to be done to guard the Borgo against even a moderately strong Turkish attack. Homedes employed one of the leading military engineers of the day, Antonio Ferramolino; under his direction Castel Sant'Angelo was turned into a powerful fortress, with a large cavalier commanding the town and the harbour. The ditch between the castle and the town was deepened to make it a sea-filled moat, isolating the castle from the adjoining peninsula and forming a refuge into which the galleys were withdrawn during the Great Siege. Later Homedes extended the scheme of defence to include the neighbouring peninsula to the west, known as L'Isola, and he ordered in Venice the huge chain, of which each link was said to have cost a hundred ducats, that enclosed the intervening creek against an enemy attack. Like the fort of St Elmo which Homedes began building on the tip of Sciberras, the fortifications of L'Isola were only completed under his successor, Claude de la Sengle, the peninsula being thence named Senglea. While these walls rose, the knights carried the war to the enemy, and continued to lend their aid to Spanish arms. In 1541 Charles V attempted to cap his success at Tunis by ousting Barbarossa from Algiers. Four hundred Knights of Malta - a force seldom if ever exceeded in an offensive campaign - supported the venture, but the tardy ways of Spanish administration delayed the expedition until too late in the season. An autumn storm shattered the fleet and left the army floundering in mud; the troops were forced to re-embark, with the Knights of Malta conducting a desperate defence of the rear-guard in which they suffered the terrible loss of seventy-five knights. This costly sacrifice of chivalry prevented the retreat from turning into the rout and massacre of the imperial army.